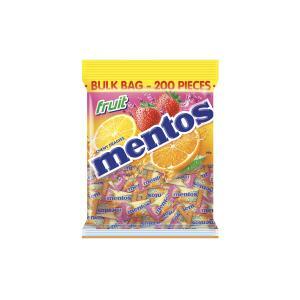 Stay Fresh with Mentos. The unique chewy sweet available in both refreshing mint and juicy fruit flavours. Sugar, Glucose Syrup, Fruit Juice 2.5% (Strawberry, Lemon and Orange), Hydrogenated Vegetable Oil, Citric Acid, Starch, Gum Arabic, Flavors, Glazing Agent (Carnauba Wax), Sucrose Esters of Fatty Acids, Gellan Gum, Colors (Sunset Yellow, Allura Red, Tartrazine, Brilliant Blue ).